Melissa Sue Anderson is an American actress whose main claim to fame was the part she played as blind Mary Ingalls in The Little House on the Prairie, a Western drama television series. She played Mary for 8 years, beginning at the age of 11. 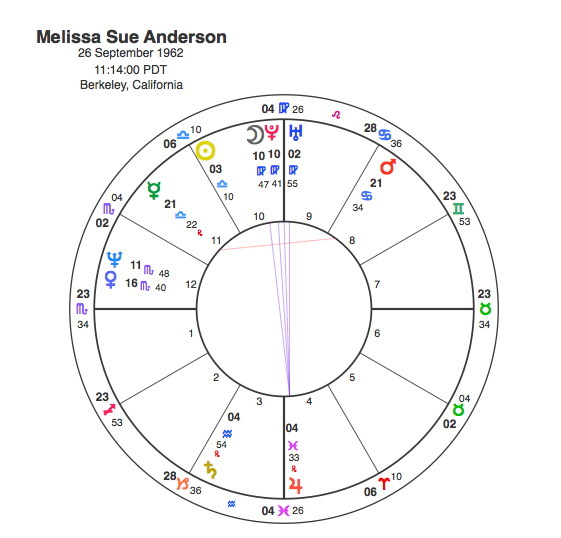 Anderson has the Sun in Libra and Scorpio rising but both receive no aspects and the most interesting point in the chart is the elevated Moon in extremely close conjunction with Pluto in Virgo in the 10th house. The Moon’s conjunction also includes Uranus and the Midheaven. The 10th house is the career and any planets close to the Midheaven will provide the major vocational themes. The planets have rulership over different periods of a life and the Moon rules childhood and in particular the period of adolescence. Both Uranus and Pluto cover sudden unexpected change, so this conjunction points to a dramatic entrance into the world of career as a child. The Moon is in Virgo in opposition to Jupiter in Pisces in the 4th house and both signs have symbolic connections to health so its not a leap of imagination to see the part she played as a child with a disability. Furthermore The Little House with its strong family storyline would be astrologically centred in the 4th house and because its a Western and the house is far away and isolated, Jupiter and Pisces would be very apt. Its often the case that when an actor is so strongly known for playing a specific part, a description of that character can be seen in the actor’s chart. It should be noted that Pluto is only 22 degrees from the Sun in Anderson’s chart and would not have to travel far to make its conjunction. The young Melissa made her TV debut in an episode of Bewitched in 1972 and Little House on the Prairie was first shown in March 1974. In those 11 years Pluto had travelled slowly forwards and was conjunct her Sun from Autumn 1972 to Summer 1974. Pluto’s natal conjunction to the Moon indicated the sudden emergence of a child star playing a disabled girl in a drama about a lone house far away. Pluto’s transit to the Sun brought it to fruition.